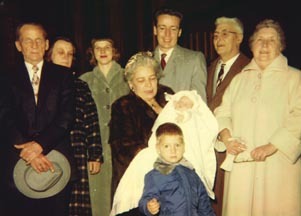 This is at the christening of Kathy Ann Mesker (the baby). The boy in the forefront is Brian Smith, age 3-1/2. William Smith, Bud Mesker (grandfather of the baby), Edith Mesker (wife of Bud).